The Labyrinth Committee is meeting regularly and making definite progress on bringing a labyrinth to our campus by summer of 2015. In an effort to inform you of their work and purpose, committee member Erin King, who is especially knowledgeable about labyrinths, would like to share this information. Why does the labyrinth attract people? Because it is a tool to guide healing, deepen self-knowledge, and empower creativity. Walking the labyrinth clears the mind and gives insight into the spiritual journey. It urges action. It calms people in the throes of life transitions. To those of us who feel we have untapped gifts to offer, it stirs the creative fires within. To others who are in deep sorrow, the walk gives solace and peace. 1. The labyrinth is a tool for meditation. 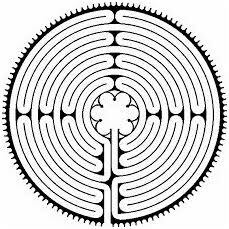 By following the path to the center, the seeker can use the labyrinth to quiet the mind and find peace and illumination at the center of his or her being. As soon as one enters the labyrinth, one realizes that the path serves as a metaphor for one’s spiritual journey. 2. The labyrinth is a path of prayer. seekers can go in, allow their minds to quiet, and then begin to pray for whatever they need in their lives. 3. The labyrinth is a place of release or renewal. A seeker can release the feelings as they arise and ask for guidance, forgiveness, or whatever is needed for healing.